The countdown to space shuttle Atlantis opening on public display has moved into a "hold" — three stories off the ground. But instead of the clock ticking down T-minus 4, 3, 2, 1, the shuttle itself was ticked down to an angle of 43.21 degrees. Workers at the Kennedy Space Center Visitor Complex in Florida shrink-wrapped, lifted and then on Monday (Nov. 26), slowly and carefully tilted the 152,700-pound (69,300 kilograms) retired spacecraft, such that they placed Atlantis at an angle only previously seen when it was in space. Despite the precarious angle, Atlantis is secure in its final orientation. The lift and tilt was achieved using industrial jacks from below, rather than cranes from above. The team practiced before raising the shuttle using a 130,000-pound block of concrete to stand in for the weight of the orbiter. Angling Atlantis was the last of the planned moves for the retired winged spacecraft, which logged 125,935,769 miles (202,673,974 km) while flying 33 times to space, including on NASA's final mission of the 30-year space shuttle program. Earlier this month, Atlantis was delivered to the visitor complex from the nearby Kennedy Space Center and rolled into its new 90,000 square-foot home. Before being raising the full 36 feet (11 m) into the air, Atlantis was shrink-wrapped — from nose to tail — in plastic, to protect it as its exhibition building is completed and more than 60 related displays and artifacts are moved in and positioned around it. Supported by massive steel beams and held in place by the same hardware that kept the shuttle mounted on top of NASA's Shuttle Carrier Aircraft, Atlantis' final resting place has its left wing just 7.5 feet (2.3 m) off the ground. Atlantis' nose sits 26.5 feet (8 m) high. Space shuttle Atlantis’ arrival at the Kennedy Space Center Visitor Complex in Florida is marked by celebration and fireworks. Atlantis made the 10-mile trip from Kennedy’s Vehicle Assembly Building to the visitor complex where it will be put on public display. As part of transition and retirement of the Space Shuttle Program, Atlantis will be displayed at Kennedy’s Visitor Complex beginning in the summer of 2013. Photo released Nov. 2. 2012. 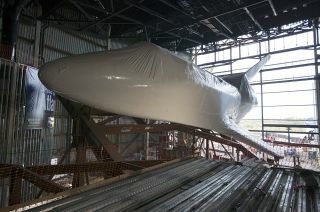 Atlantis will remain wrapped until March, when the plastic will be removed and preparations will begin to open its two 60-foot (18 meter) payload bay doors using a cable and pulley system suspended from the ceiling of the five-story building. In the meantime, work will continue on finishing the facility, including sealing its fourth wall, through which Atlantis entered. Preparations also continue on the building's exterior, which was designed to immerse visitors in the space shuttle's story.